Last fall Touratech-USA were fortunate to have Simon and Lisa Thomas in our booth at the International Motorcycle Show in Long Beach. As the world record holders for the longest continuous motorcycle journey they know adventure bikes and they know the most effective gear. 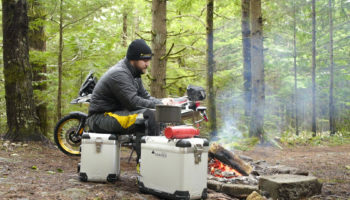 The Thomas’ have been using Touratech Zega panniers for years and swear by them. We asked them to share their thoughts at IMS.